Guys, just couldn’t help it. Woke up a bit earlier today and just had to put this wedding invitation design idea on the “paper”. Of course, I used Photoshop wedding brushes in this one too 🙂 I don’t know if it is the same about you, but I got these ideas early in the morning. Just after waking up, I just feel that urge to put these images from my head onto the paper, or digital canvas – like in this case. I went to several weddings my self and invitations are always a challenge for anyone who’s doing them. And it’s something people notice and often comment, so you want to make sure to make them real good. Now, I’m not saying that my solution is something special. What I wanted to point out was – how much easier life gets when you have such great little helpers like Photoshop brushes around when you need them. If you like it, here is a layered .psd (Photoshop CS3, CS4, CS5… and newer – Join GBG community, get FREE downloads) file which is, at the same time, a tutorial explaining how I got that engraved effect on the paper. Download will be available subscription free for next 5 days (as usually). If you’re worried on how to create this paper texture – don’t! It’s included in the Photoshop file (above) and I will make a tutorial on this too. Soon. 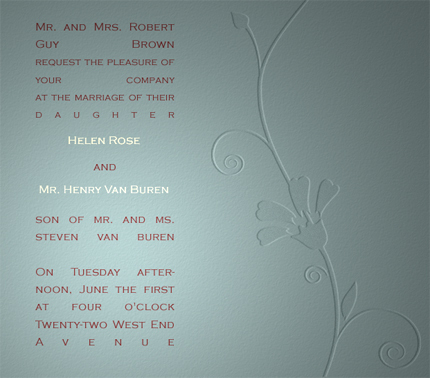 I hope this helped, at least a bit and maybe you will get new ideas on creating Wedding invitation. If you wonder where to find a brush like this, I got this one, it’s from our Photoshop wedding brushes – Wedding Ultimate Pack. Thats really nice, except for the type. Justified is hard to read especially like that when on word is stretched to fill one line. People see the letters instead of the word. This is so cool, what are the chances… I’m designing my sister’s wedding invitation and searching in google for tribals i got to this page (don’t know how) Thank you so much, this page is way cool with lots of resources and info. Ok, i ran into a problem. I can recreate exactly what’s on this file from scratch, even the paper texture, which i ilike the watercolor paper better. But, if i try to make it bigger, in blue (less green than yours) it doesnt do it. It just looks darker. I made the emboss and the contract of the selection higher (since my canvas is bigger it needs more depth) I even try several copies of the layer with a progression of contract. Nothing works, it just makes it look like a watermark. Anyway i need help, what ami doing wrong?. And once again, thanks for what you do for us! Sorry Fred. I am not sure what exactly is the problem. Why don’t you send me the psd file and I will see what I can do. My email is under “About” section. I have been trying to do this for my wedding invitation designs that I sell on Etsy…but I can’t figure out how to get “modify” to show up!! I use Photoshop CSC3…can you help me??? I made this little video for you, so you can see exactly how it’s done. Just make sure to hold Ctrl (on Aplle Cmd) while clicking on a layer with a shape. I don’t use a MAC, so what is the command for a PC??? Dear Stephanie, just as I said in my reply you need to press CTRL.